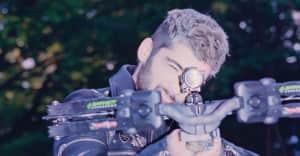 Earlier this year, Zane Lowe sat down for a lengthy interview with Zayn Malik about his new album. The two reconnected today as Lowe made Zayn's "It's You" his latest world record. The singer debuted the falsetto-heavy ballad live last week on The Tonight Show. Listen below, and look for Mind Of Mine next month. The album's lead single, "Pillowtalk," is currently No. 6 on the charts. Update, 2/25/2016, 1:35 p.m.: Zayn also previewed the video for the track. The singer posted a short black-and-white clip recently on Twitter. In the teaser, a woman in a floor-length dress walks towards a shiny car as "It's You" plays in the background. Watch below. Update, 2/25/2016, 5:40 p.m.: The "It's You" video drops at midnight. The bad new is that stream from this afternoon's Beats1 world premiere seems to have been removed (when reached by The FADER, Apple declined to comment). The good news, however, is that the for "It's You" drops tonight at midnight. 'It's You' video drops with Mind of Mine Pre Order at Midnight EST tonight !!! !